Many smaller riders may feel “sized out” of the joy of bent riding. They shouldn’t. Both HP Velotechnik and Volae have excellent and affordable bents that will fit just fine. To fit the broad range of riders, bent manufacturers have arrived at various solutions for achieving the correct fit. Some of the solutions work better than others. HP Velotechnik and Volae both have exceptionally smart sizing solutions. HP Velotechnik addresses and resolves the problem by having a single sized frame* with a highly adjustable boom, plus two additional options. Everyone knows about their adjustable boom and how it’s the envy of all the other bent makers. But even at the minimum length, it still doesn’t fit everyone. But it should, right? Indeed. And two routes get us there. First, HPV boom tubes easily can be cut several inches to create a normal fit for riders who are shorter than the published minimum (this is a factory-ordained procedure that I can do state-side or it can be done in the HPV factory when the order is placed). This method maintains a 50%/front 50%/back balance of weight between the wheels. It’s easy, it’s fast, it’s cheap, it’s no problem at all. Secondly — since HPV seems always to consider everything — seats can be ordered with the seat positioned 4 cm (about 1.5″) further forward on the mounting brackets, providing a still shorter x-seam. HPV doesn’t use the “sprint brace” method of bracing a seat, so this maintains their strong seat mounting, which is one reason why HPV’s feel so responsive. Some people wonder if there’s a downside to HPV’s boom tube solution, for example a loss of efficiency. It doesn’t. Don’t worry about it. HPV frame tubes are uniquely shaped and over-sized resulting in an exceptionally stiff and efficient frame. That is no reason to rob yourself of the pleasure of riding an HPV. What it does do, however, is add some extra weight from the boom tube. Riders who like to minimize weight and don’t need the flexibility of the full length of the adjustable boom can trim off the excess boom material. Lastly, riders with shorter legs may wonder if they can put down their feet, flat-footed, while still sitting on the seat. It’s a valid concern. I have found this to be more an issue with HPV’s Ergo Mesh seat than with their Body Link seat. This last seems to fit a wider range of riders. Also, HPV makes bents of several different heights. The Street Machine is the highest seating, the GrassHopper is a few inches lower, and the Speed Machine is lower still, making it rather easy to touch the ground with flat feet. At the end of the day, there’s an HP Velotechnik to fit almost everyone. Volae, on the other hand, being the fast, light, high-value bent on the block, takes the exact opposite approach. Instead of a single size, adjustable frame, they make four frame sizes (small to x-large). Instead of a single size, adjustable seat, here too they make four. So, with four different frame sizes and four different carbon fiber seat sizes, from small to extra large, riders as short as 4’10” can walk away, not only with a correctly fitting bent, but with an extremely good correctly fitting bent. Even better, the size small weighs less than the size large. And, of course, you can mix the seats; the size medium seat fits just fine on the size small frame. The handlebars are adjusted in a similar way: three different handlebar sizes, seven different stems, and the bars can be adjusted higher and lower to achieve a perfect fit for everyone. The seat can also be micro-adjusted, by sliding it fore and aft, so riders can fine-tune their fit, depending on the shoes they’re wearing that day, or how deeply they feel like angling the seat for this ride, etc. Two of these skewers actually pass right through the frame — not above or below it — which is one reason the seat-to-frame connection is so strong. What riders can not see — and the biggest difference between V’s and other bents — is that these skewers don’t merely pierce the frame, there are actually tubes welded inside the frames through which the skewers pass. 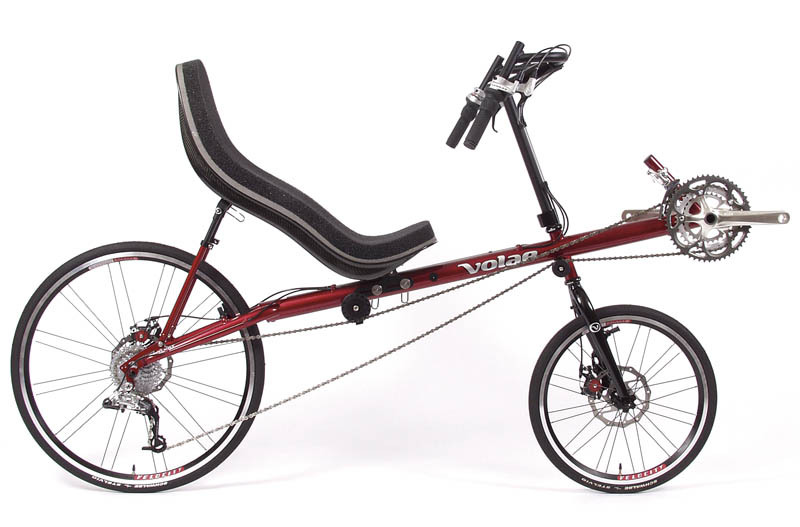 The result, in addition to creating a strong seat connection and keeping the frames water tight, is that Volae frames are particularly stiff in that area directly below the seat, a location which experiences huge forces, and results in a wonderfully stiff and efficient frame. This connection, combined with the stiff 4130 ChroMo sprint braces, results in a highly efficient translation of leg force to speed. So, if you’ve been feeling “sized out” of the joy of bent riding, take a new look at Volae or HP Velotechnik bents. Chances are, there’s a fabulous bent sized perfectly for you. ← RAL color chart just in — this is fantastic.